This two - bite tapa has many possibilities. It can be made for get togethers. It can be brought along in your picnic basket that you're taking to the coast. It can be packed in your child's school lunch. And, it can be packed inside your carry on bag for that picnic on the plane! Ham and cheese go together. Cheese and fruit pair well together. It's like a test question on a college entrance exam: Ham is to cheese as cheese is to.......(answer: fruit.) Now put them all together, and you've achieved the pythagorean theorem. 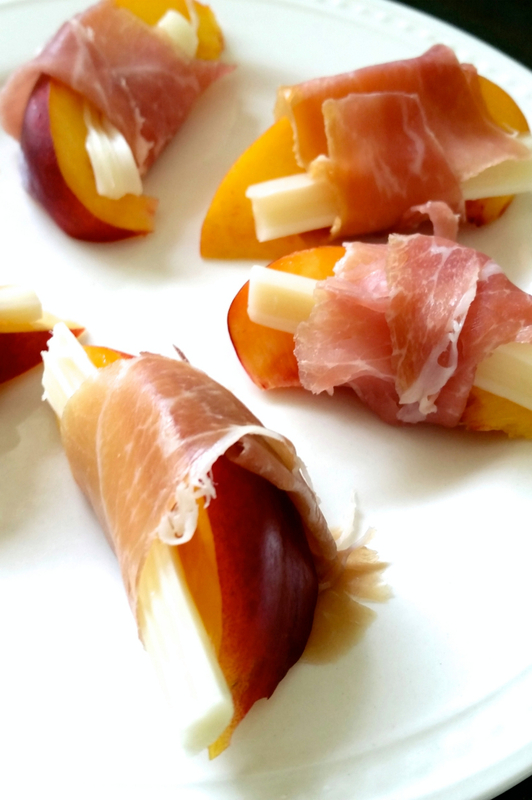 All together, the silky thin ham, soft mozzarella, and crisp nectarine work really well together. My favorite Spanish ham is Iberico, which I would eat every morning of my life in place of bacon if I could, but that would be beyond my husband's pay grade and way out of my budget. But serrano is still quite stellar. You can find a really affordable small package of it at World Market. This serving cost me under $10! Slice the nectarine into small segments. Separate the cheese into strips matching the size of the segments. Place the cheese on top of a segment, then wrap the ham around it.